Why do crosses between closely related species fail to produce fertile hybrids? A new study shows that differences in the levels - not necessarily the sequences - of certain key proteins are crucial in mediating reproductive isolation. Two individuals are defined as belonging to the same biological species, if matings between them give rise to viable and fertile offspring. Crosses between closely related, but already distinct, species produce hybrid offspring that are either inviable or sterile, and thus cannot give rise to a self-propagating hybrid lineage. In the early 20th century, geneticists and evolutionary biologists developed a theoretical model to explain why distinct species that share the same common ancestor soon diverge to such an extent that their hybrids are unable to reproduce. This model postulates that certain genes evolve more rapidly than others – and in a manner which ensures that they function well within each of the diverging populations, but interfere with one another when brought together in hybrid genomes. Such genes are referred to as Dobzhansky-Muller gene pairs, or hybrid-incompatibility genes. “Although several Dobzhansky-Muller gene pairs have been isolated in the last five years, their function remained essentially unclear prior to our study,” says Professor Axel Imhof of LMU’s Adolf Butenandt Institute. 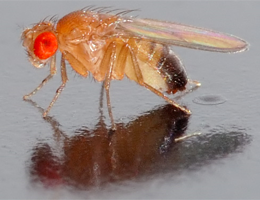 In their new study, he and his team have now characterized the functions of the genes Lhr (lethal hybrid rescue), which form a Dobzhansky-Muller gene pair in hybrid matings between fruitflies belonging to the closely related Drosophila species D. melanogaster and D. simulans. Hybrid males produced by crosses between these two species are inviable, while the female hybrids are viable but sterile. Imhof’s group has now shown that the proteins encoded by the genes Hmr and Lhr form a molecular complex, which binds to the centromeric regions of chromosomes, i.e., at the site of the typical constriction found in paired sister chromosomes prior to cell division, and play an important role in chromosome segregation later in cell division. The problem for the hybrids lies in the fact that, although both D. melanogaster and D. simulans synthesize HMR and LHR proteins, they make these gene products in very different amounts. Thus D. melanogaster makes far more HMR than D. simulans, while the latter produces LHR in much higher concentrations than D. melanogaster. Nevertheless, the HMR and LHR proteins retain the ability to interact with each other, irrespective of their origin. As a result, in hybrid cells, HMR-LHR complexes are formed in much larger amounts than in the cells of the parental species. Moreover, this increase cannot be accommodated by the number of centromeric binding sites available in the hybrid. The resulting discrepancy between the amounts of complex and centromeric binding sites leads to binding of the complex all over the genome. It is this abnormal distribution of HMR-LHR complexes that is responsible for hybrid lethality. These results show that it is the relative level of the proteins concerned, and not any differences in their amino acid sequences, that plays the crucial role here. It also encourages the LMU researchers to search further for species-specific differences in protein levels with the aid of quantitative proteomics. “In addition to the proteins HMR and LHR that we have focused on, other factors have been identified which are involved in mediating reproductive isolation between species. “In future experiments, we intend to look at these proteins in more detail, and will analyze their functions in true species and their hybrids,” says Imhof.